Is that.... a Twins hat with a unicorn on it?? Well, yes it is! This, apparently, is not a licensed product, but who cares? Unicorns! 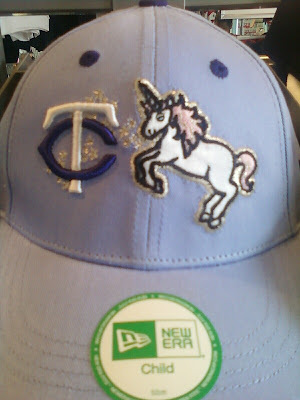 I think it is a licensed product, as I saw it for sale in the official Twins shop at Target Field. OK, I admit it. I bought it.